Presenting the development of the modern Spanish novel from 1600 to the present, this Companion draws on the combined legacies of Don Quijote and the traditions of the picaresque novel. Essays focus on invention and experiment and examine the role played by historical events and cultural contexts in the Spanish novel's evolution. 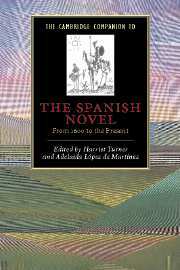 Including a chronology and guide to further reading, the survey reveals the innovative techniques characterizing the Spanish novel as well as the debates surrounding it. Introduction: mirror and text Harriet Turner and Adelaida López de Martínez; Part I. Since Cervantes . . .: 1. The legacy of Don Quijote and the picaresque novel Anthony J. Close; 2. The enlightenment and fictional form Rebecca Haidt; Part II. The Nineteenth Century: 3. The regional novel: evolution and consolation Alison Sinclair; 4. The Folletín: Spain looks to Europe Elisa Marti-Lopez; 5. The Realist Novel Harriet Turner; 6. History and fiction Geoffrey Ribbans; 7. Gender and beyond: nineteenth-century women Spanish writers Lou Charnon-Deutsch; 8. Decadence and innovation in fin de siglo Spain Noel M. Valis; Part III. The Twentieth Century: 9. From the generation of 1898 to the vanguard Roberta Johnson; 10. The testimonial novel and the novel of memory Gonzalo Sobejano; 11. Questioning the text Bradley Epps; 12. Women and fiction in post-Franco Spain Akiko Tsuchiya; 13. Cultural alliances: film and literature in the socialist period: 1982–1995 Isolina Ballesteros; 14. The novel beyond modernity Teresa Vilarós; 15. Writing about writing Randolph Pope.